Gluten-Free Cinnamon Roll Mug Cake that’s sweet, tender, and ready in less then five minutes. No need to make up a whole batch of knead-and-bake cinnamon rolls when you can have this simple, cinnamon roll mug cake recipe. How many times have you had a craving for gluten-free cinnamon rolls only to realize that it takes time to make, knead, and bake them? I LOVE cinnamon rolls, but sometimes I’m what you call a lazy baker. 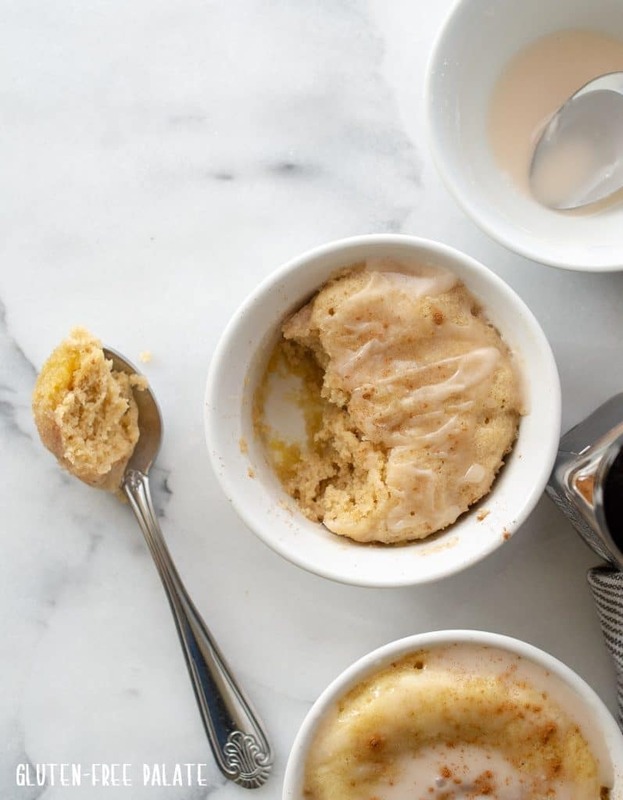 This Gluten-Free Cinnamon Roll Mug Cake is for avid bakers and lazy bakers, and you are going to love how simple it is to make. There are no bowls required (unless you want to double the recipe) and you don’t have to turn on your oven. I make my mug cakes, like this cinnamon roll mug cake recipe, in ramekins or coffee mugs. 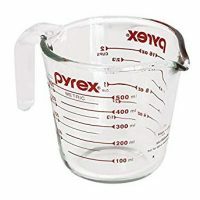 The only cleanup after is the ramekin, some measuring utensils, and a spoon. Please tell me you love that this is a minimal cleanup recipes. You can bake this in the oven at 350 degrees for 10-12 minutes if you don’t have a microwave, but otherwise it’s ready in less then 5 minutes. I usually devour the whole thing by myself, but it can be shared, or you can double the recipe. 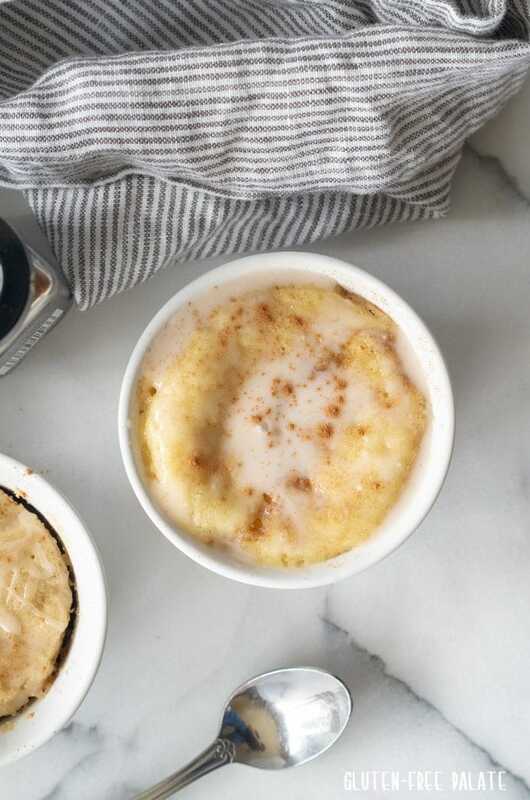 This gluten-free cinnamon roll mug cake is going to be your next go-to breakfast treat, trust me. The texture is perfect, and so similar to a cinnamon roll. You can add extra cinnamon if you like loads of cinnamon like me. You can also enjoy it plain if you don’t want to add the icing. I don’t have a grain free version ready for you, but as soon as I do I’ll cross post it here. 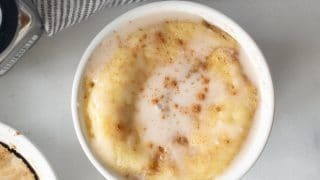 You can use dairy-free milk to make this cinnamon roll mug cake recipe dairy-free, and you can use coconut sugar if you don’t want to use granulated sugar. Just note that this gluten-free cinnamon roll mug cake will be more of a caramel color if you use coconut sugar. I’ve only tested this with Bob’s Red Mill 1-to-1 flour, but you should be able to use most blends that have a combination of potato, tapioca, and rice. 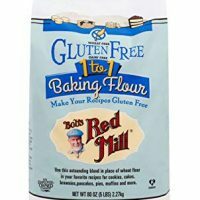 The majority of the gluten-free flour blends out there have a combination of those three. I haven’t personally tried making this with flax egg yet, but when I do, I’ll update the post. Also, be sure to check the comments to see if anyone has made it with an egg replacer. If you have any questions, please feel free to leave a comment. This recipe is supposed to be a simple cinnamon roll in a cup recipe, and I hope that you love it as much as we do. Looking for more mug cake recipes? You’ll love my Gluten-Free Mug Coffee Cake and my Gluten-Free Chocolate Mug Cake. Both are simple, require minimal cleanup, and are ready in less then 5 minutes. When the girls have a birthday party to attend I’ll sometimes make a mug cake and send it with them (if I don’t have a cupcake in the freezer for them). If you are looking for a more traditional cinnamon roll you’ll love these Gluten Free Cinnamon Rolls. If you make this gluten-free cinnamon roll mug cake please stop back by and let me know what you think. You can leave a starred review and a comment below. Gluten-Free Cinnamon Roll Mug Cake that's sweet, tender, and ready in less then five minutes. 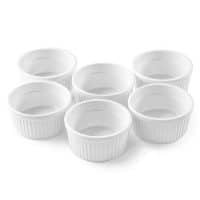 Place oil, sugar, and egg yolk in a medium sized microwaveable coffee mug or ramekin. Mix with a fork until combined. Add in milk, flour, cinnamon, and baking powder. Mix until just combined. Microwave for 1 minute to 1 minute and 30 seconds until desired consistency is reached. If you like your cake on the softer side I would only microwave your mug cake for 1 minute. Remember that it will continue to cook a little after you take it out of the microwave. For the glaze, in a separate small bowl mix together powdered sugar, milk, and vanilla. 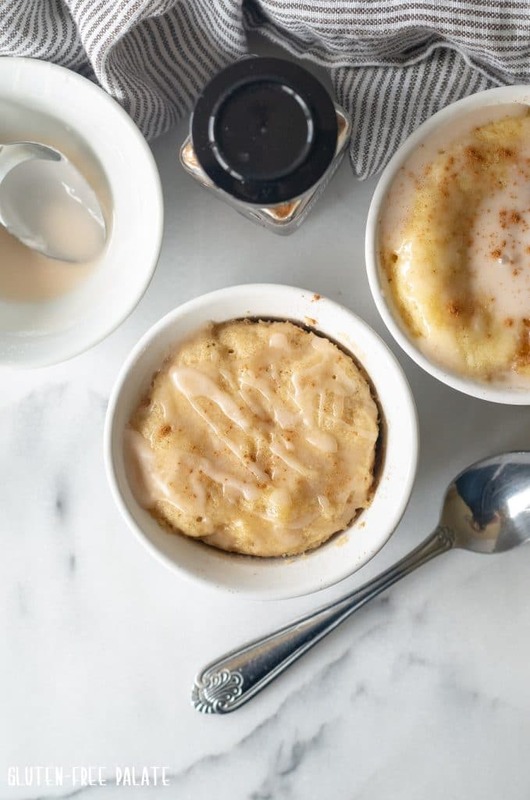 Spoon over warm cinnamon roll mug cake and enjoy! Oh my, these mug cakes look perfect! I love cinnamon roll and this is simply genius! This looks so yummy! Can’t wait for the grain-free version! So glad you liked it. Thank you for letting me know. It should not have been hard, or like a big chunk of pancake. Did you use a different flour blend or possibly did you pack the flour? There’s an error on the recipe under “1/4all purpose gluten free flour…” Is it 1/4 cup? Teaspoon? Tablespoon? I made this with Birch Benders pancake/waffle mix (grain free/Paleo), used a whole egg, forgot milk, added pecans and it came out delish!!!! So glad you liked it Liana. Thank you for sharing how you made it. I made one in the morning and just fried the egg white to go with it. Amazing! This mug cake was delicious! It tastes just like a cinnamon roll but was so easy to make. Plus it was great for being gluten free and dairy free! 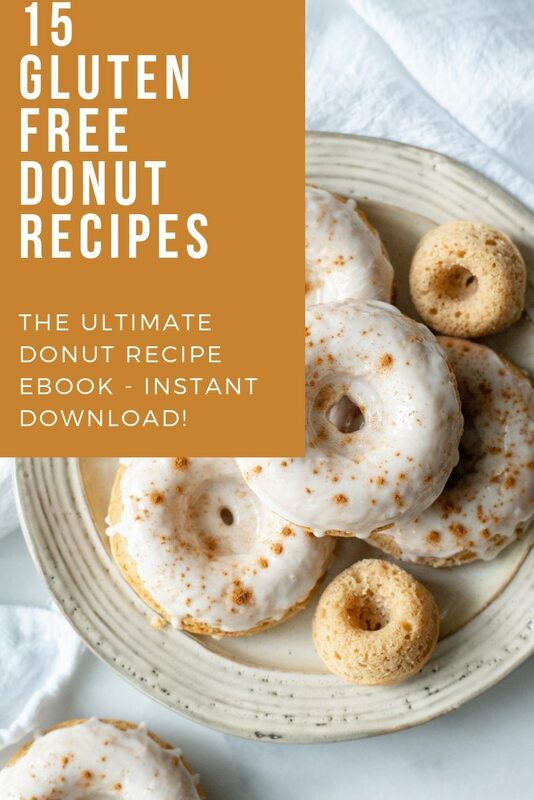 I definitely recommend trying this recipe! 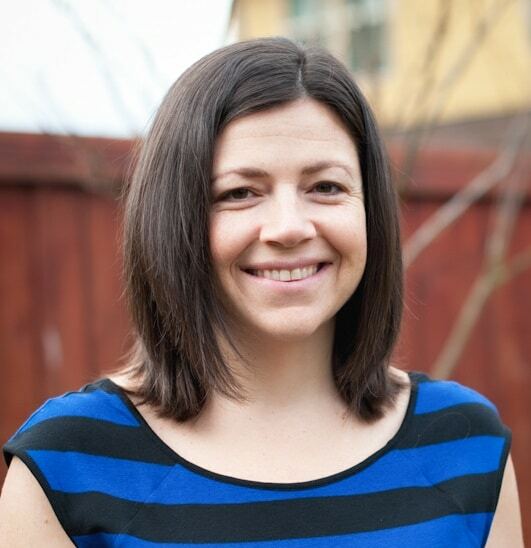 Thank you so much for taking time to stop by and leave a comment! I’m glad you liked it. Oh dear! What have you done! 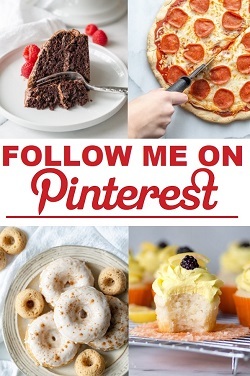 This is so quick and easy to make & we all love it….I’m going to be a very fat person very very very soon! I used rice milk to make it dairy free. Then added pecans & mixed dried fruit & maple syrup to the icing sugar so it came out tasting like pecan pie! Thank you from a dairy & gluten free happy home! I am so glad you like it! You will be fine if you don’t eat one every day 😉 Thank you for stopping by.